Ryen Russillo, host of The Russillo Show on ESPN, was arrested in Wyoming today. The details on the Teton County Sheriff’s Office inmate list are scarce, but the 42-year-old Russillo was charged with criminal entry. (c) Criminal entry is a misdemeanor punishable by imprisonment for not more than six (6) months, a fine of not more than seven hundred fifty dollars ($750.00), or both. We called the sheriff’s office for more details on Russillo’s arrest but were told to call back after 6 p.m. We reached out to ESPN for comment and will update if we get it. Two people were asleep in the condo when they heard someone come in. They didn’t know the man and asked him to leave because he was drunk, according to reports. Police arrived a few minutes later. “Occupants pointed the suspect out who was found in a bedroom,” Jackson Police Lt. Roger Schultz said. Russillo, of West Hartford, Connecticut, reportedly had bloodshot eyes and slurred speech. “He couldn’t coherently answer any questions,” Schultz said. 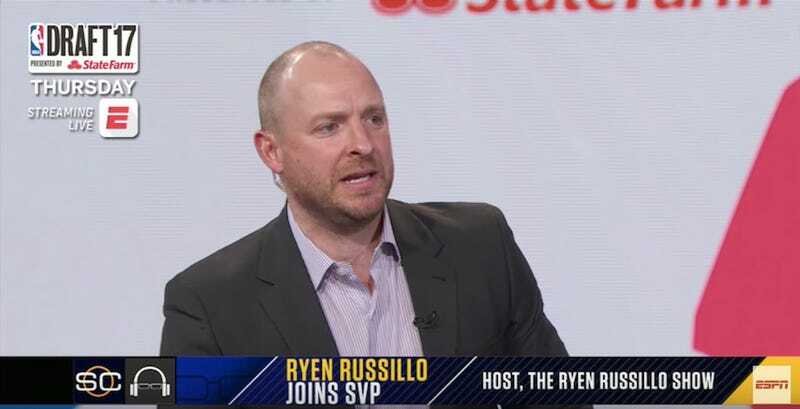 “Officers found the defendant, later identified as Ryen August Russillo, lying on the bed in the south bedroom naked except for his pants around his ankles,” the probable cause affidavit states.